I think everyone will admit that buffalo wings are pretty amazing! Nothing beats the crispy chicken coated in delicious buffalo sauce then dipped in creamy ranch dressing (bleu cheese for others)! Here is a recipe for a version even vegetarians can enjoy and they are baked not fried (major plus!). Plus, Pete is a vegetable fanatic (which couldn’t be any more the opposite of me) so when I saw this recipe I knew he would become obsessed. Two of his favorite things combined! Trim the head of cauliflower into appetizer-sized pieces. Set it aside. 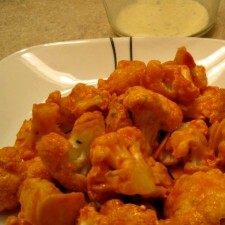 Dip each piece of cauliflower into the batter and allow the extra batter to dip off. Place on a greased baking sheet. Spray the tops of the florets with Kelapo nonstick cooking spray. Bake for 20-25 minutes. Melt the coconut oil in a saucepan over low heat. Mix together melted coconut oil and Frank’s hot sauce.